Remarkable scrambler able to manage her own care following a small rock slide that severely injured a finger. "Don't freak out! ", she demanded of the party. After a successful summit, while descending back into the Snow Lake Basin down a 20 degree boulder field, a scrambler knocked loose a rock. This rock was supporting several other rocks, triggering a slide above her. Other party members recall seeing somewhere between "several" and "many" "large" rocks sliding down from above where she had been. Somehow in this mayhem, one of the rocks hit the scrambler. The rock landed on the scrambler's hand, crushing and partially severing the last .5 inch of her third finger on her right hand. Amazingly, the scrambler, who is a registered nurse, took charge of her own medical incident. She told me how to wrap up her hand, demanded everybody not freak out, and said she was okay in all other regards. In the face of extraordinary pain, the injured scrambler was still able to hike out. 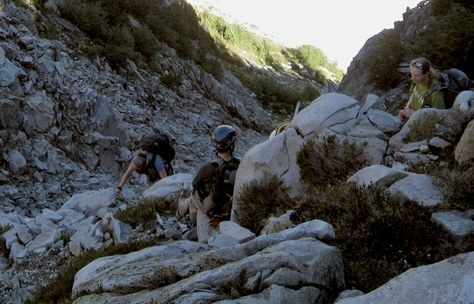 Other party members carried her pack, and I guided her down the boulders and then out the trail. In total she hiked about 2 hours holding her hand above her head to reduce the pain. At the trailhead, all the other party members packed into the two other cars and drove home. I drove the injured scrambler straight to Good Samaritan Hospital in Puyallup. We arrived just before midnight Saturday. The surgeon reattached the severed digit, but is not highly confident it will thrive. If not, it will have to be amputated. The injured scrambler is now looking at about a month of recovery before she can return to work. Activities like rock climbing are likely over until next year. I mentioned in my report that the surgeons were attempting to reattach her crushed/partially severed finger. That proved unsuccessful. The last digit and knuckle of the finger had to be amputated. The scrambler is scheduled to go back to work in about a week, (5 weeks after the accident). Everybody with a good view of the accident agreed that this seemed like a one-in-a-million type rock fall. While the boulders tended to teeter back and forth, there was nothing to suggest a whole pile of them might come crashing down. I always read other people's accident reports to see if there is something I can learn to make my trips safer. In this case, I don't think there is much to learn other than freak accidents occur and everybody should be prepared for unexpected accidents.